Image Gilles Martin Raget | This can´t be happening, it is not true, this is nightmare for the Kiwis! This is switching places from first races of the finals with OR as TNZ is unable to win a single Start. Don´t you even bother to read what I wrote before today's race, this Final has gone beyond any logical analysis. I will make a final attempt though: Which is the new weak point of the now invincible James 'Achiles' Spithill?? Team New Zealand knows exactly what to do at this point, they just need to win the start + reach run to Mark 1 then hold ground as they've been doing in last races coming from behind, waiting to OR to make an error to take the Cup home once more. But the 'Oracle' is spelling terrible omens for the Kiwis , their former highest Commander, now fighting against them for foreign lands was required an extreme sacrifice by the Pythias in exchange to protect his perfect winning record achieved in the Battle Fields of past campaigns. - If Oracle wins, this achievement will match Homer legends from the Iliad and Odyssey altogether. Race Replay below || Today I changed the header banner. Till some months ago the CSN 2012 Boat of the Year (TNZ Tractor) , and lately Artemis Big Blue occupied that space, Emirates Team New Zealand led the way in this Cup on every aspect. Oracle was always behind, and when the Cup Final started we all saw and foresee that beyond some incredible close racing along the way New Zealand had an edge. and they even threw the towel one day.. they literally quit from racing to re group. After that OR Design & Shore crew went on a mission to give Spithill a better boat, and slowly that goal was achieved , to the point where Oracle is faster downwind by a bit and by 4knot upwind when they are foiling. 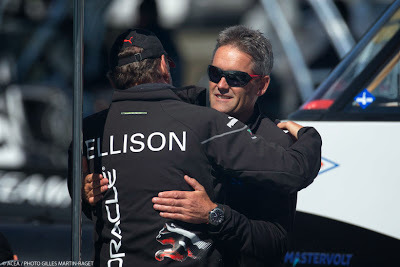 Time has gone by and Oracle has won several consecutive races, the score now is 8-5 NZ (8-7! On the water) but they are still one race from losing the Cup. Two days ago the Kiwis were a mile or less to win it all in light weather, where they just destroyed the US boat, is was total blast in sub planing conditions but the 40mins limit denied them the Cup. I think New Zealand will win this today, or at the end for that matter. Oracle winning would be a hurdle too high to surpass for them, more having such a great team like TNZ only one shot away. The game has been leveled, Oracle followed the leader and now they are showing the way. NZ has a 'slower' boat but they keep sailing better overall in my view. Oracle it is just racing to perfection as they have no other choice, but just one error will give the Cup to Barker , Ashby & their crew. New Zealand will win finally but Oracle deserves now a strong recognition, specially on their shore/design crew as I mentioned several times, today CSN banner in their honor. Cheers!